One of the most obvious results of many disasters will be the sudden lack of constant night light. With the electricity out, you will have to resort to candles and oil lamps to provide any sort of constant illumination for reading or working in the dark. However, the lack of electric lights will also highlight the few bright specks remaining, clearly marking places where people live to the looters and other scum searching for prey. Therefore, it will be necessary to conceal the light you use to see by putting blackout procedures into place. Historically, when enemies were near lights from campfires, torches, and later lamposts and lightbulbs would be obscured so that important positions wouldn’t be given away, “blacking out” the distinctive shapes of people and equipment. Most prominently, blackouts were instituted during WWII in an effort to prevent bombers from being able to select specific buildings (particularly factories, airports, and naval yards) or even smaller towns in the countryside. Without light to differentiate important targets from worthless ones, bombers were forced to scatter them randomly, which resulted in more widespread destruction but also saved vital arsenals needed to keep the war going. One a personal level during an emergency, a blackout would include efforts to dim outside lights including campfires and cooking fires, as well as hiding lights on the inside from prying eyes. In a world where many houses would be abandoned, dark and empty you want your home to just blend into the landscape rather than being a glowing beacon of life for the looters. There are a variety of ways to hide light from outsiders, including temporary and permanent options. Permanent blackout methods are best for windows and such that you won’t need to use to see out of during the day, since you’ll be purposefully blocking the transparency of the glass in order to hide your nighttime lights. Temporary options are generally better for doors and other fixtures that you’ll need to open or use frequently, though they tend to be less efficient at blocking light since they’re made to be removable. Blackout curtains or drapes are among the best temporary methods of hiding light. Dark, opaque sheets and drapes taped to windows and doors. For best coverage, multiple layers of sheets should be used to prevent a stray gust from wipping a single layer aside. Line them up so that seams aren’t all in the same place to make a truly excellent barrier to light. Multiple layers of duct tape. Obviously this will use a lot of tape if you have several windows, but it makes an effective removable cover. If done properly, you could even leave certain marked strips of tape as a single layer, so that if you need to see out you could just remove that piece instead of all the tape. As a side bonus, it also helps minimize broken glass entering the home during an invasion. Keeping lighting limited to windowless inner rooms, with all doors leading out shut. This is the fastest and simplest method, but it leaves you vulnerable unless you plan on dousing all light every time someone leaves the room. Black trash bags. If you lack dark drapes, then trash bags are a good substitute. Stretch them out, tape them down, and place them over openings. The chief downside here is that you can use trash bags for other things, and after awhile they’ll probably tend to rip or tear if you’re not careful. Paint or tar applied to windows. If done properly this should completely block any light and keep it from escaping and giving away your position. Make sure that the paint is a particularly dark color, and always check to make sure nothing peeled off left an opening over the course of the day. Letting a bush or shrub grow up in front of the window, covering it. This requires a good deal of time, and if the shrub loses its foliage you may be suddenly exposed. Otherwise though, this can actually be decent because it looks more natural than a painted window. 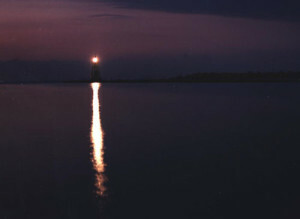 Keep your flashlight or lantern focused towards the ground, to avoid shining it across long distances. Another key factor in a successful blackout is light discipline. If you have flashlights, lanterns or candles that you carry about and use for seeing in the dark, care should be taken to keep them shielded despite your passive protections. Even something as simple as keeping flashlights pointed away from windows and doors could reduce the chance of your home being noticed during an emergency. Particular care should be taken near dusk when you might still be finishing up tasks outside. One flash from a lantern while you’re on your way home could be seen from a great distance, so carefully shield them so that all of the light is directed downwards where it can’t be seen as easily. Maintaining proper blackout conditions is key to protecting your retreat from undesirables. Be sure you’re ready with the skills and materials needed! How would you enforce light discipline and protect your retreat? Let us know in the comments and make sure you share this article on your social networks. I have given much thought to not being seen at night, but as a tenant and not a home-owner I have made plans to bug-out because after an economic collapse I’d soon be turfed out into the street anyway. For night-time in the woods I keep in my B.O.B. fluorescent fishing lures which cast enough light to see inside a tent or to read a map, without casting light too far afield to give my position/movement away. I have colored plastic over my torches and will decide in the field which color is best to move without being seen. I will use a Dakota fire-hole to cook in the hour before dark so no glow will be cast at night, and boiling my food in lidded pots instead of roasting it will limit the aromas drifting too far. Taping aluminum foil to the windows will block the light very well. I have done this and seen this done in the arctic during the summer when it is light out all the time. Works better than black trash bags. There is a blackout covering at garden stores called panda film, very think, black on one side, white on the other. Leave curtains on your windows, cut the panda film to fit over the curtain. Then, cut cardboard strip, like out of a soda case box. Put the strips on the panda film on the walls around the window and curtains, black side out. Then take a staple gun and staple the cardboard strips to the wall. This cardboard makes sure the film does not have tiny holes from the staple. From the outside it appears that the curtains are closed with no lights on in the house. The white side inside reflects the light that you have and seems brighter. Black tempra paint (art paint) works well for windows, easy on and washes off, no damage. I have often given this thought because I do have a small solar panel set and four marine high capacity batteries that will allow the refrigerator to run, but lighting is one thing that can give away your position to those looking to steal what you have in times of emergency. The one thing you did mention was the blacking out of windows. I had not thought about that, so thank you. But, there is always a but, with all the night vision and infrared sensors available today, it will be hard to quell the heat signatures from the home when lights are burning inside, even though they may not be able to be seen from outside the home! Large rolls of 8 mill black poly can be had for cheap at the big box home improvement stores. Cut to fit, attach with duct tape.